Face masks have quite a few naysayers, who pooh pooh their potency and dismiss them as a get-rich-quick scheme for bored beauty executives. And they’re right—to some degree. Face masks only work if they’re used consistently. When used correctly, face masks can bequeath the plumpness of a baby’s bottom onto your cold, dead cheeks. If they’re not used consistently, face masks are an excuse for leisure. Both uses are valid. Below, we’ve assembled the five best face masks, as dictated by you. Now, we need you to vote on which one reigns supreme. Go forth! Many have tried to hate GLAMGLOW for its ridiculous price and tenuous celebrity endorsements; many have failed. Concocted as a 10-minute anti-aging serum in a can, this baby works. The mud base is from the South of France (because why wouldn’t it be? ), while its infused with cucumber, lavender, green tea leaves, and volcanic pumic rock. For those who want perennially flawless skin and can justify a $54 purchase, this is probably your soulmate. It’s freaking expensive (though Sephora has a holiday pack thing that makes it nicer right now) at $69, but my small tub lasts for ages. In case you just absconded from a bunker unearthed in South Dakota and need a refresher course on the beauty rituals of the American woman, there’s really only one thing you need to know: Korean skin care is a whole damn thing. Especially sheet masks. Hawked by Taiwanese powerhouse My Beauty Diary, these guys come in a whole host of swanky flavors (Black Pearl! Royal Jelly! Imperial Bird’s Nest!) and leave your face plump and renewed after 30-minutes. They also look cool. Beauty bloggers swear by this off-brand clay healing mask and for good reason. Made up of extremely fine, dry calcium bentonite clay that, when mixed with apple cider vinegar, dries on your face to detoxify and momentarily shrink your pores. Essentially, this is the Benjamin Button of skincare. The only drawback? It’s your responsibility to buy, mix, and tailor the ingredients to your specific skin needs. It’s a blessing and a curse. The secret ingredient in this bad boy is activated charcoal, which has a bit of a cult following. Why you might ask? It’s basically a vacuum cleaner for your face. 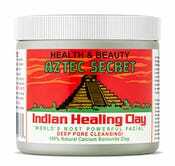 It detoxifies, removes anything icky, heals inflammation, reduces active break outs and cleanses. For those enamored by the interworking of human anatomy, this face mask is right up your alley. It feels like liquid latex over you skin and peels off to reveal the harrowing detritus sucked out of your pores. It’s disgusting and amazing. Boscia’s Luminizing Black Mask is for all skin types and the mineral-rich concoction will leave you skin clear, while minimizing your pores.